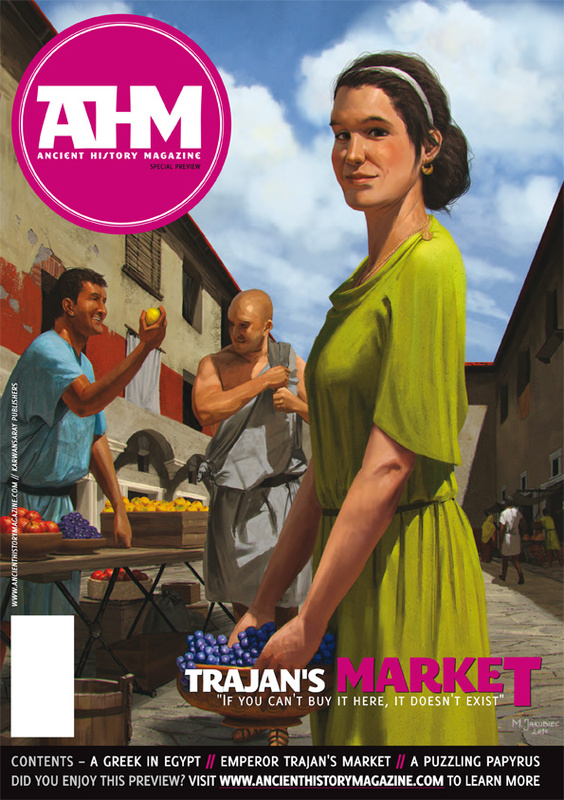 Roman Times: Hannibal's Route Over The Alps or just Horse S***? Hannibal's Route Over The Alps or just Horse S***? Onze-Lieve-Vrouwekerk (Church of Our Lady) in Breda, Netherlands. Image courtesy of Wikimedia Commons user Vassil. Digitally enhanced by Mary Harrsch. 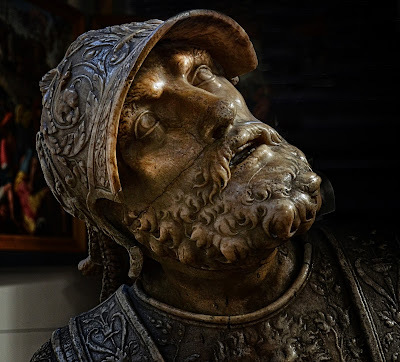 Earlier this month the news media was whipped into a frenzy by reports that Bill Mahaney, a geologist and professor emeritus at York University in Toronto, Canada, had "found" Hannibal's route over the Alps. Unfortunately, many of the mainstream media outlets, eager to garner a bump in pageviews by armchair historians, published the findings and inferred a resolution without attempting to verify if the information provided was, in fact, definitive or could have had an alternative explanation. Some even used the word "pinpoint" even though the findings are based primarily on the inexact process of Carbon 14 dating. Dr. Patrick Hunt, director of the Stanford University Alpine Archaeology Project, is another researcher who has been seeking Hannibal's route across the Alps since 1994. He is quoted towards the end of the above article but he, however, is more in favor of a northerly route. "I have spent over 20 field seasons tracking Hannibal, not only in the Alps but also in Spain, France (Gaul) and of course Italy and elsewhere including Carthage and Western Turkey. Our Stanford teams have crossed at least 30 Alps passes and we’ve always used Polybius as a guide. Polybius gives some helpful clues but never names the pass. He [Polybius] suggests it was the highest pass known at the time, which doesn't necessarily mean the highest pass known today, an obvious logical fallacy," Hunt explains. "The Clapier-Savine Coche route—an ancient Celtic pathway with a summit around 8,500 feet—best fits Polybius in my opinion and that is shared by many others. This verified route has been used for thousands of years and while there is erosion on the precipitous descent that has taken away most of the ancient pathway, the summit valley floor is fairly stable and has been for millennia. Mammal animal mire there has also built up over a long time because the Clapier-Savine Coche summit valley has been a grazing place since at least Celtic times. I always encourage Alps explorers to weigh multiple passes against each other rather than to merely examine one pass and conclude prematurely or only read about it, which is dangerously inadequate." "The route in question is too often promoted by popularists who've never climbed competing Alpine routes, of which about 10 passes need to be totally eliminated before this study has any real credibility," Hunt observes, "The fact that so many today in the popular media are claiming this now solves Hannibal's route is both sadly superficial and premature. Although they could be hypothetically right, there's no real hard material evidence presented yet. Until they find actual material artifacts, it's moot. Datable remains of elephant dung would be much better, but possibly not enough because Hannibal's brother Hasdrubal followed him a decade later. I know several other Alps passes with at least as much corroborating evidence and one pass far better in terms of fitting Polybius, the best source." Although famed naturalist Gavin de Beer first proposed the Col de Traversette as Hannibal's crossing point in his 1955 book Hannibal's March: Alps and Elephants, eminent Polybian scholar, F.W. 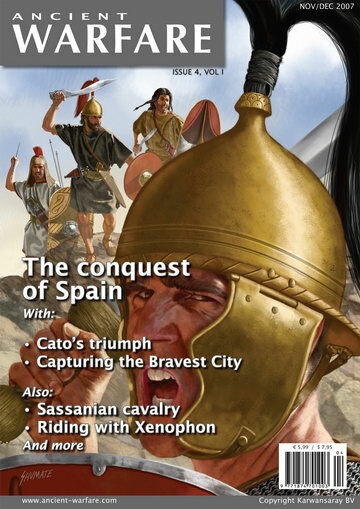 Wallbank rejected de Beer's theories the following year in his 1956 article Some Reflections on Hannibal's Pass published in volume 46 of The Journal of Roman Studies. Dr. Hunt's Stanford research team thinks the Clapier-Savine Coche is at least as good and actually closer to what Polybius describes as the Col de Traversette. "The Clapier-Savine Coche has a huge campground right by the summit as Polybius describes," explains Hunt, "If the new mire-dung spot is the campground Mahaney et al. suggest, it is on the west side of the Col de Traversette about 1500 feet below the summit, not at the summit as described by Polybius. The Traversette summit is also a knife blade scarcely capable of holding 100 people, let alone an army. There is no way Hannibal could have addressed his army encouragingly from the Traversette summit." "Also, Polybius states Hannibal's forces slipped through fresh snow to ice below from the previous winter on the initial descent, not frozen ground or firnpack as interpreted by the Traversette group," Hunt continues, "Such snow traces fitting Polybius are found each year on the summit of the Clapier-Savine Cloche around 8200-8500 feet but there is still ample grass for animal foraging and cattle graze there currently as well." Furthermore, Hunt thinks a route leading to the Col de Traversette must be twisted somewhat to make it fit the description given by Polybius. Polybius says after Hannibal's army marched north of the point where the Rhone and Iskaras Rivers meet for approximately 800 stades (about 91 miles) the army began their ascent of the most rugged part of the Alps and found their way blocked by a fierce mountain tribe known as the Allobroges (according to Livy the most famous and powerful tribe in Gaul). The border of the Allobroges territory was defined historically by the "Iskaras" (Polybius) or "Arar" (Livy) River, which Hunt thinks corresponds to the modern Isère River. "Given that the Rhone delta and mouth were less extended southward in antiquity due to less alluviation buildup and that Hannibal crossed at least a day's march inland - both because there were more salt marshes (etangs) then around the Rhone mouth and in order to avoid Massilian Roman allies around Marseilles - the Rhone crossing should be around Avignon, an ancient fording place", Hunt observes. 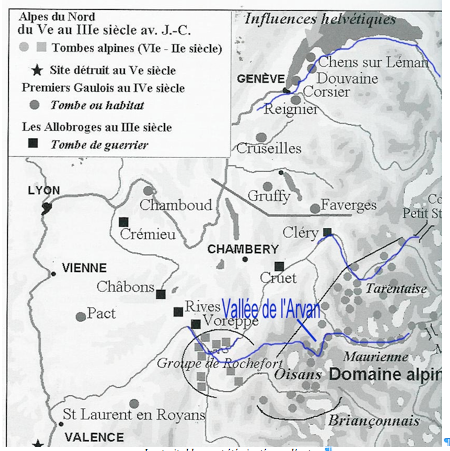 "The traditional Allobroges boundary - like that of so many tribes partly demarcated by a river confluence - would then be the Isere-Rhone junction beyond Valence, not the more southerly Drome-Rhone confluence, proposed by Mahaney's Traversette group." "Mahaney's team proposes the first ambush occurred in the upper Valdrome (which was not Allobroges territory). This would require Hannibal to make a double Alps crossing then drop down southeastward into the Durance River watershed," Hunt continues, "They then have Hannibal marching up the Durance but turning away from the perfectly accessible broad northeast Mont-Genevre route (which they claim could be blocked by hostile Celts, but isn't very likely) detouring into the narrow Guil far southward into the Queyras region and over the extremely difficult Traversette, which takes them southward away from Torino and the Taurini tribe, the point where Hannibal eventually emerged according to Polybius." 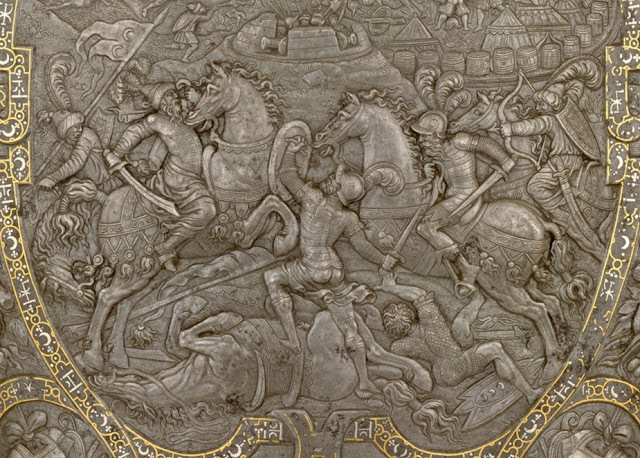 This rather fanciful scene thought to depict Hannibal battling the Romans at Cannae adorns the shield of Henry II of France. Today it can be viewed at the Metropolitan Museum of Art in Gallery 374. Image courtesy of the Metropolitan Museum of Art. 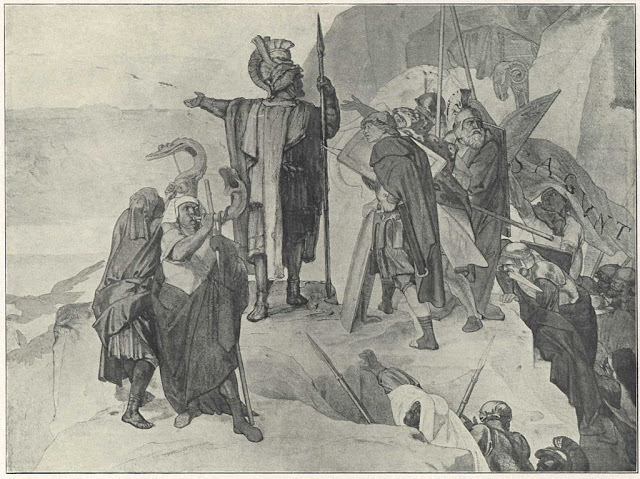 "Sir Gavin de Beer originally proposed the Grimone pass for the ambush of an Allobrogian tribe," French scholar Dr. Geoffroy De Galbert, author of Hannibal et Cesar dans les Alpes, explains. "Furthermore, de Beer claimed their oppidum (hill fort) was located at La Batie-Montsléon. Hannibal’s companions claimed that the Allobroges spent the nights in their oppidum and returned in the morning to guard this delicate passage. But it is 35 km between the Col de Grimone and La Batie-Montsléon. A 35 km journey twice a day would be practically impossible." "The Durance river around Embrun cannot be the most difficult river to cross of all Gaul." de Galbert states, "On the contrary, this description perfectly matches crossing the Isere at Chateauneuf-sur-Isére near Valence. 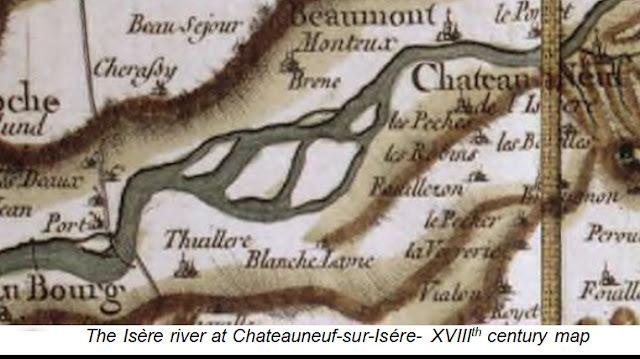 The Isère river was divided into several branches at Chateauneuf-sur-Isère before being contained. The Latin historian Orosius, living in the 5th century CE, also claimed that Livy had confused the Durance with the Isère." "Furthermore, de Galbert adds, "Livy wrote : Hannibal, leaving the Druentia, and advancing for the most part through a champaign country, reached the Alps without being molested by the Gauls who inhabited those regions. (Book 21, 32)." "Between the crossing of the Durance near Embrun and the Alps, there are no plains. On the contrary, after crossing the Isere at Chateauneuf sur Isere, there is a large plain leading to the entrance of the Alps," de Galbert concludes. "Mahaney's group also claims the Po River only starts near Traversette," Hunt observes, "but that's a geographic fallacy as there is no one source for a major river and the Dora Riparia is a primary Po watershed as well and runs directly eastward into the Po west of Torino. They also say only the insanely narrow Traversette has the view for Hannibal's speech but clearly must have only tried the modern Clapier footpath and not the adjacent Savine Coche broad ridge immediately west where the ancient path ran, which has a great view of Torino and the Po plain." "If you assess the northern route toward the Clapier-Savine Cloche, you will find a satisfying first ambush place in the Isere near Voreppe, (clearly Allobroges territory)," Hunt points out. The likelihood that a major confrontation could have taken place there was also suggested by the recent discovery of what appears to be the remains of a large Celtic oppidum (hill fort) near there. In this article Hunt also describes a two-tier rockfall at the Clapier-Savine Coche pass a short distance from the summit. "Polybius actually describes more of a multi-tier precipice," Hunt says, "and the Clapier-Savine Coche descent has multi-tiered rockfalls that geological weathering dates to more than a few thousands years ago." 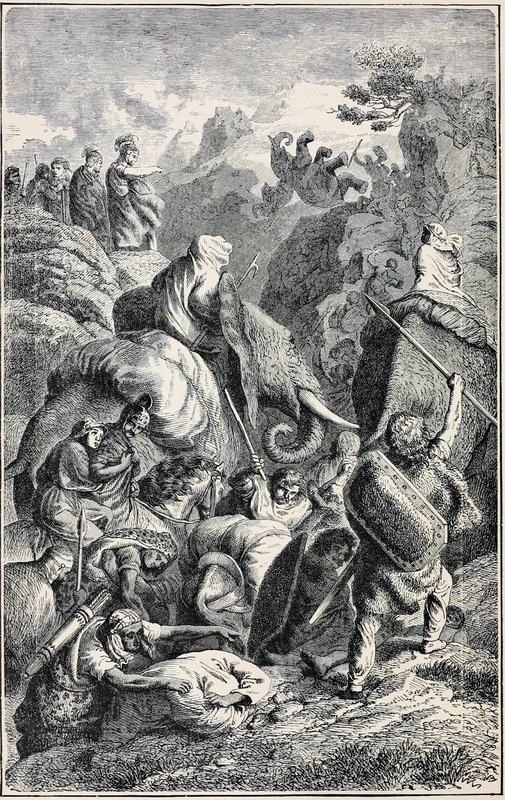 Hannibal crossing the Alps from The illustrated history of the world for the English people, 1881. But perhaps one of the best analyses of all candidate passes as of 1959 was prepared by John Hoyte, a British engineer whose team actually took an elephant over the Alps in an effort to settle the question in July 1959. Hoyte first distilled a list of conditions defined by Polybius in his Histories. (f) give a distance of three days' march, from here to the plains. (g) lead straight down to the land of the Turini. (h) be a day's march from a probable site for the 'bare-rock' ambush (or a day and a night for the baggage and elephants). (i) be positioned so that the most direct route to it from the Rhône passes by the 'Island' (where the river 'Skaras' meets the Rhône) seven days' march from the sea (three days from the sea to the crossing of the Rhône and four from the crossing to the Island). He then scored each pass on a scale of 0-5 for each of these parameters with 5 awarded for a complete fit and less for more doubtful cases. 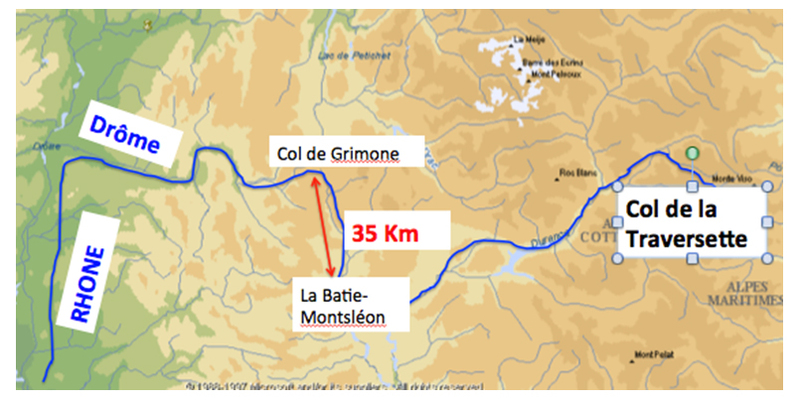 Hoyte's group launched their attempt from Montmelian, France and followed the valley of the Arc River with the goal of crossing the Col de Clapier, since that pass scored the highest in Hoyte's comparison study of Polybian parameters. However, the pass had become narrowed and dangerous due to rockfall so the group retracted down into the valley and crossed the Petit Mon Cenis, which branches off the Clapier route at ~7150 ft a short distance before the final Clapier ascent, a route proposed by Napoleon. After 10 days of travel, the expedition successfully reached Susa in Italy. Details of the expedition and a wonderful series of photographs can be viewed on Hoyte's website (http://johnhoyte.com/alpine-elephant/). Hoyte also published an account of the expedition in his book, Trunk Road for Hannibal - with an elephant over the Alps, in 1960. It was republished in 1964 under the title Alpine Elephant - In Hannibal's Tracks. Geoffroy de Galbert, also points out that later supply trains were unable to use the proposed route across the Traversette. "During the 14th and 15th centuries, the Maurienne and Gresivaudan valleys of the Alps were swept by the Black Death," de Galbert points out, "These valleys had been the traditional routes used to ship salt from mines in the south of France to Italy's Po valley. The Traversette pass lay within a region unaffected by the plague but was so narrow a heavily laden mule could not cross there. Mule convoys had to be unloaded at the foot of the pass and reloaded onto the backs of men who then carried the cargo across the pass. Finally, in 1480, a tunnel 75 meters long and 1.5 meters in height was built under the Traversette pass to provide a navigable route for salt shipments." "If the mules could not cross the Alps through the Traversette pass in the fifteenth century, they could not do it in Hannibal's time," de Galbert concludes. "In fact, in pre-Roman antiquity, there was only one wide road from Spain to the Po Valley," de Galbert continues, "This road crossed the Alps by the Maurienne valley. Hannibal with his huge army could not have used a simple mountain trail. This is further supported by the fact that no neolithic or Iron Age remains have been found on the roads from Durance to the Traversette pass." A map showing the locations of Iron Age remains found in the Maurienne region of the French Alps. Dr. Geoffroy de Galbert points out that no neolithic or Iron Age remains have been found between the Durance and the Traversette pass. Image courtesy of Geoffroy de Galbert. But in the latest research, Mahaney tackles the question from a different perspective. The new findings most recently reported are based primarily on the discovery of a layer of soil disturbance and the findings of "a mass animal deposition event" - bacterial remains indicating the presence of a large number of equines in the vicinity. Although the articles currently circulated by the media claim the Carbon 14 dates obtained for the material in the disturbed layer point to 218 BCE. Contamination is always a concern too and testing waste from ruminants can also be problematic as vegetation can have varying amounts of carbon that could impact test results as well. "The new hypothesis places the boggy dung mass on the eastern side at 2580 meters," Hunt points out, "Given the warmer climate around Traversette, since it's further south, vegetation is more lush there, so Alpine tribes have grazed animals there for thousands of years." Andrew Wilson of Oxford's Institute of Archaeology, apparently agrees. 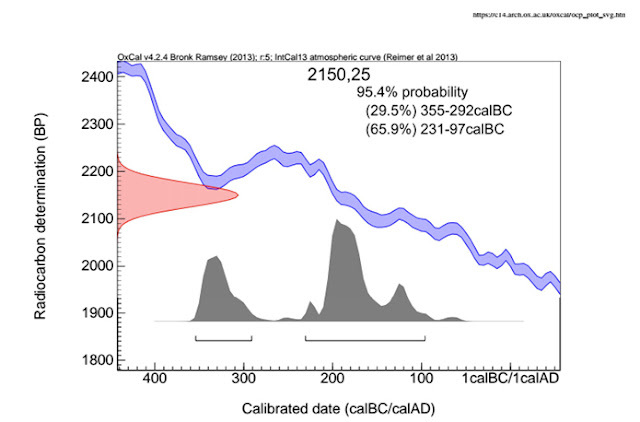 In a recent New Yorker article he expressed doubt about Mahaney's claims pointing out that, due to the wide date range encompassed by the Carbon 14 analysis, the disturbed layer probably accumulated over a considerable period of time, perhaps from animals drinking at the mire rather than a single event during the passage of an army. In fact, Hannibal's expedition through the Alps, although truly legendary in its scope and military context, was not the first mass migration across the mountain range that could have left sizable animal waste deposits. When Hannibal harangues his troops about their fear of crossing the Alps, Livy says Hannibal himself describes earlier mass migrations. 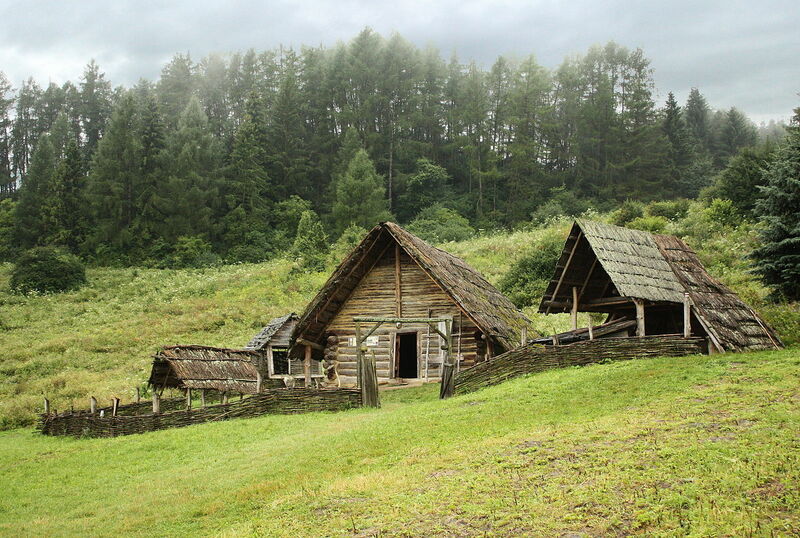 A reconstructed late La Tène Period (3rd-1st century BCE) Celtic settlement in Havranok,Slovakia. In fact, activities preceding the Gallic War of 225 BCE culminating in the Battle of Telamon had involved large scale movements of Gauls across the Alps. 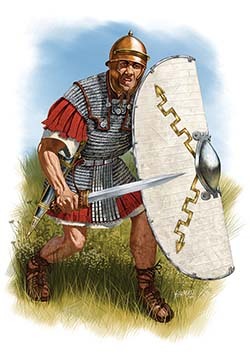 "After their defeats by Rome in the 280s, the Gauls were quiescent for forty-five years; but eventually a younger generation took their place, 'full of unreflecting passion and without experience of suffering or peril' (Polybius' Histories 2.21.1-2). They began to disturb the existing equilibrium with Rome, and invited Gauls from across the Alps to participate in a new war...The leaders of the Po Valley peoples held out to the leaders of the Gauls beyond the Alps the promise of the rich loot that awaited them in Italy, along with assurances that Gallic military power could easily overcome the Romans; after all, this had happened before, when Rome itself had been taken and held for seven months by Gallic warriors (Polyb. 2.22.4-5)." - Arthur M. Eckstein, Polybius, the Gallic Crisis, and the Ebro Treaty. De Galbert explains, "At least five armies crossed the Alps between 231 and 97 BC. In 231 B.C., the Insubres and the Boii asked some Gallic tribes of the Alps and the Rhone Valley to come and help them fight the Romans. (Polybius, II, 22). Hannibal’s army crossed the Alps in 218 B.C. Hasdrubal, Hannibal’s brother, crossed the Alps in 207 B.C. with an army larger than Hannibal’s. The consul Fulvius Falcus crossed the Alps in 125 B.C. to help Marseilles when it was attacked by Salyens. Then the consul Marius crossed the Alps around 125 B.C." These activities all occurred within the time encompassed by the Carbon 14 dating period of the Col de Traversette equine waste remains. In fact, Hasdrubal's crossing of the Alps in 207 BCE, significantly complicates the search for Hannibal's crossing. Although Livy makes it sound like Hasdrubal followed in the path of Hannibal, Polybius uses the word "shorter" in his fragmentary reference to Hasdrubal's easier crossing in Polybius' Histories. 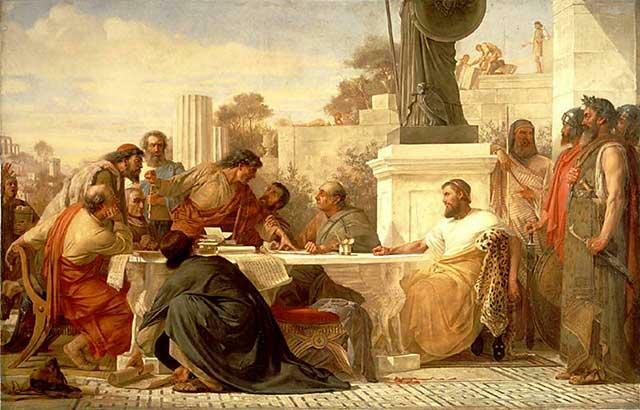 Much of the easier aspect can be attributed to Hasdrubal's much more friendly reception by native tribesmen who have, by then, decided to join the Carthaginian's war efforts. But to have a reportedly shorter journey suggests a deviation from Hannibal's original route at some point. 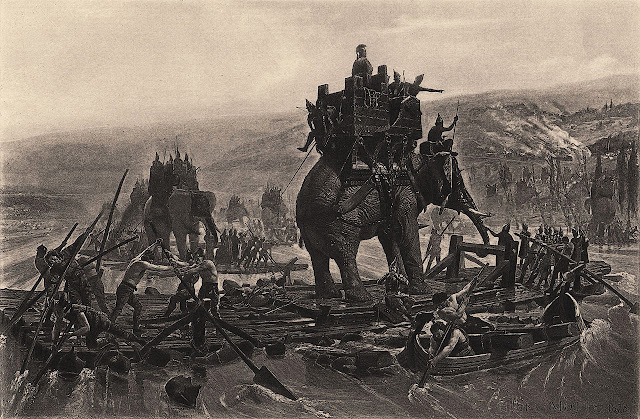 Furthermore, Hasdrubal brought war elephants with him as well, so even finding pachyderm waste or remains may not definitely prove a route was Hannibal's and not Hasdrubal's. "To a viewer in the Val di Susa, three passes (Mont-Genevre, Clapier-Savine Coche, and Mont-Cenis) all converge in the Dora Riparia river watershed en route to Torino. If an ancient observer had known Hannibal came through here via the higher middle route of the Clapier-Savine Coche and if also knowing Hasdrubal came through here via the shorter and lower Mont-Genevre, it would still appear they came through the same Val di Susa before it joins the Po Valley," Hunt observes. Apparently,The London Times has expressed their skepticism about the latest claims, too, as have noted historian Tom Holland and others. Tom Holland was a little more succinct, "The evidence is s***," he said. "The amount of evidence needed is substantial indeed across multiple parameters; this new claim just does not have the kind of support required despite sounding so scientific," Hunt observes. The bottom line as I see it is that, despite our wishful thinking, none of the current findings are truly definitive without the discovery of supporting archaeological remains. Perhaps we should take the advice of Polybius, who once cautioned his readers about fully embracing statements by another Roman historian, Q. Fabius Pictor, "My own opinion is that one must not treat his authority as being of little weight, but at the same time one should not regard it as final." 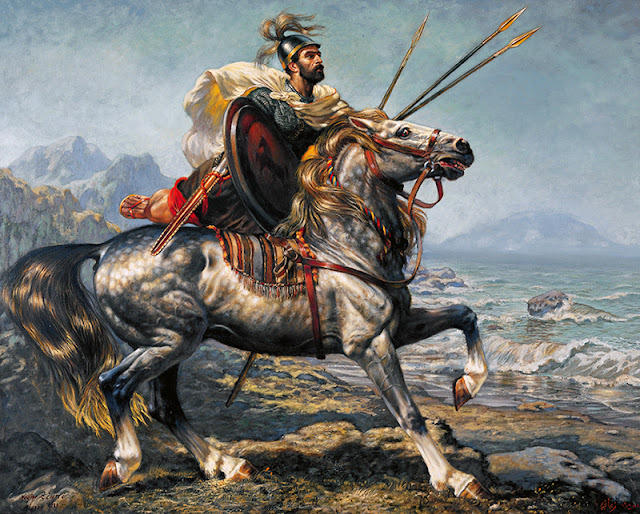 A Numidian horseman by Hocine Ziani, an Algerian artist who is a founding member of the Central Army Museum in Algiers. Other examples of his amazing work can be viewed on Pinterest. I must admit I was intrigued with the possibility of finding ancient equine DNA from a breed originating in North Africa, though. Hannibal's elite Numidian cavalry probably would have brought their own mounts with them so that does pose an opportunity for further study. However, finding the whereabouts of ancient equine DNA from North Africa for comparison, possibly locked away in some museum or research institution's dusty basement, may prove as challenging as trying to find a crated Ark of the Covenant in a government warehouse! Hoyte, J. (1960). Trunk road for Hannibal; with an elephant over the Alps. London: G. Bles.